Greek finance minister Yanis Varoufakis kept impeccable records of Greek efforts to negotiate with European bank creditors, the IMF and ECB in 2015. (Proof that freedom fighters can use smart phones to record, not just the NSA) His good faith and technical competency in seeking a win-win negotiation creates a powerful baseline that proves the European Union’s austerity policy is war by financial means. Varoufakis assumed that the EU would seek a solution that made it possible for the creditors to be paid from a healthy Greek economy. He learned instead what it is like to face a financial coup d’etat. Debt is a weapon. Once debt is fraudulently induced in large amounts, engineered with the help of a compliant elite earning “fees for our friends,” it transfers control to a handful of large banks. Then multinational corporations and private investors can strip the country and pick up assets and acquire market share at prices significantly below market. Policies can be implemented that lower life expectancy and weaken the health and intellectual capacity of a population. In a weakened state, they will submit to the loss of national and individual sovereignty and accept high-tech feudalism. This is a vulture dance hidden behind banks and bureaucracies that lie, obfuscate with complex process and give long speeches. Taxpayer money is merely free capital used to strip a country as economic control is transferred to private and corporate investors at windfall prices. From 1955 to 1995, Fortune 500 revenues grew at approximately the same rate as the GNP. Subsequent to 1995, after the inclusion of the technology companies in the index and the creation of the World Trade Organization, Fortune 500 revenues grew at more than double the rate of the underlying economy. Varoufakis documents what that centralizing corporate tornado looks like when it hits on the ground. It looks like statecraft fronting for criminal enterprise – because that’s what it is. It is a planetary coup d’etat by financial means. It is the privatization of government by the “just do it method.” The price of centralizing the economy is destroying economies until and unless the revenue and income flow through the invaders financial statements. 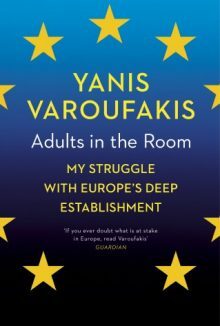 The Guardian called Adults in the Room “One of the greatest political memoirs of all time.” Varoufakis makes a compelling case that people who are committed to a human culture and democracy must unite throughout Europe to stop this economic lawlessness. If he succeeds in doing so, the Guardian will be proved right. If you read one book on current events this year, it should be Adults in the Room.